I am filled with joy. Right now, as I type, a nice man is in my kitchen installing a brand new dishwasher, one that works. It's going to be so awesome; I may have a party for it this weekend. At the party, we could use all the glasses in the house and just run the dishwasher again and again, until they're all clean. The house is peaceful; O and the X-Man are at school and Baby J is napping. And I'm trying very hard not to laugh out loud. Not because of my giddiness over the dishwasher, but because the dishwasher guy just farted. No lie*. I could hear it from the other room. Farting aside, I'm thrilled he's here. Sunday night, I came home from Yoga to find a very happy and proud husband. Happy, because he was about to leave for a beach trip in the name of work (translation: several days of hanging out with all his lawyer friends at a conference, with no kids, of course. And getting to write it all off. Lucky.) Proud, because, as he announced before I was all the way inside, "I emptied the dishwasher for you!" That's nice, I thought, in my Yoga-induced haze. 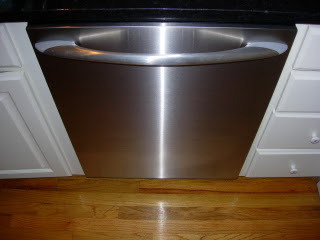 But, as I walked past the dishwasher, I noticed that it had only completed half a cycle. I've always had issues with that dishwasher. In fact, it's probably my fault that it didn't work, low expectations and all. It was here when we moved in. It looked so smug sitting there, in all it's stainless steel, European glory. It was a Bosch. Please don't tell me how much you love your Bosch. I'm thrilled for you, I really am, but we had no love for ours, nor it for us. We may have found it intimidating; perhaps it was just too sophisticated for us. One problem with the Bosch is that, down heah in the backwoods, there are only two companies who will work on it. One of them we've used for other things, so we called them when it broke the first time. Within that company, only two guys are trained to work on Bosch. One of them is Sully. Sully is mean, pompous, insane and not, I'm sorry to say, all that bright. And he came to our house, several times. He talked the whole time he was here, whether or not we were in the room with him. I think he evened talked when we weren't home. His final analysis was, "It's fixed. Make sure you run the hot water for three minutes every time before you start it." I expressed my feeling that this did not equal "fixed." Sully told me I was wrong and that every dishwasher in the world is like this. Never mind that the heat part was working fine until he messed with it; we had called about something else entirely. Sully was like a dog worrying a bone. He refused to admit that there was any problem other than the fact that we were too selfish to warm up the water for the pampered brat of a dishwasher. He came again and again, chipping cabinets, spilling water and in general being a nuisance. The only nice thing he ever did for me was turn off a pot of chicken stock that was boiling over. But, who wouldn't? Herr Bosch still didn't work and the company sent the other worker, after my normally mild-mannered husband called and told them that Sully was never to darken our door again. In the end, the dishwasher sort of worked and I got to think my husband was pretty hot, standing up to the repair company like that. He was defending my honor: Sully called me a liar when I mentioned that I had never had to run hot water for a dishwasher before. When I realized that the dishwasher was, once again, not doing its job, I decided on the spot to buy a new one. I couldn't take another (six or seven) visits from Sully. Anyhow, as I considered the possibility of searching through the cabinets and drawers, seeking out everything that still had food and soap streaks on it, I felt a sudden need to kick something. I went outside and kicked the fence, which hurt. I'm immature like that sometimes, Yoga or not. When I was pregnant with Baby J (hormones! ), I got mad at A about one thing or another. Maybe he was walking too loud, who can remember? I got so mad at him that I threw a nectarine at the wall. I'm far too uptight to leave a smashed nectarine just lying around, so I picked it up and headed towards the trashcan. When I got there, my loud-walking husband was bent over the can throwing something else away. I'm not proud of this, but I squished the nectarine on his head. I ground it right into his bald spot, and it was totally satisfying. In fact, the enzymes from the fruit may have helped him grow more hair. So, in a sense, I was being nice. After kicking the fence, I went in to help A. reload the dishwasher. Finally, the job was done, the cabinets cleared of all soapy food remnants. And the dishwasher wouldn't start. And it was time for my hapless husband to leave with his friend. As they drove down the road, listening to stupid boy music, I would be at home, with four hungry children, and a crop in the fieeeeeelds. Wait. That wasn't me, that was Kenny Rogers. I would be left with three hungry children, a load of dirty dishes and a broken dishwasher. Before Lucille A. arrived at his destination, the clouds had parted. I realized I was having a pity party for nothing. Not only would I be getting a brand new dishwasher, I could get whatever I wanted. A. would feel so bad for me that he wouldn't dare question the price. He'd be so happy to be able to come home, guilt-free, new dishwasher installed. The very next morning, I called him to let him know how tickled I was, so he could enjoy his vacation work and come home with a clear conscience. I dropped Baby J off at the nursery and headed down to the best appliance store ever, Jeffers-McGill. I was greeted with a smile by the salesmen, who looked like a band of Angels. I swear I heard harps as I walked through the door. I was giddy with anticipation, secure in the knowledge that I could let the dishes pile high, because the installer would be here the very next day. Jeffers-McGill does not carry Bosch. Wise choice. And I will never buy an appliance from anyone else ever again. I really should have saved myself the pain and embarrassment of kicking the fence. *In the interest of full disclosure, I have to say that the sound quite possibly could have been his shoe sliding across the floor. But, I was still laughing because...it sounded like a fart! Lovely dishwasher! My own Miss May Tag arrives tomorrow, my first dishwasher in almost 7 years.